June 6, 2010 - By now virtually the whole world has heard about the debacle of the "Gaza Freedom Flotilla." And virtually the whole world has condemned Israel for it. On May 31 Israeli naval forces stopped a group of six ships trying to break the blockade of Gaza. Unfortunately there was loss of life; several activists aboard the main ship, the Mavi Marmara, died, and several Israeli soldiers were wounded, some of them seriously. Around the world Israel has been demonized for its act of "piracy," attacking a ship delivering "humanitarian" aid to suffering people and whose mission was "freedom." 1. The facts do not support this portrayal. 2. The facts hardly matter anymore. The "Freedom Flotilla" billed itself as a nonviolent, peaceful mission to help the starving people of Gaza. The truth is that the mission was not nonviolent, it was not peaceful, and the people of Gaza are not starving. The "nonviolent" protesters were not nonviolent. Video exists showing that those on board had prepared metal rods and knives, slingshots, and broken bottles to attack the Israelis. Not generally reported but noteworthy are spent bullet cartridges found on the Mavi Marmara that were not of any caliber used by Israeli commandos, some of whom did suffer gunshot wounds. Also found were propaganda photos of protesters who were supposedly injured. Evidence that these photos were shot during daylight showed they were prepared hours before the operation, which took place at night. The "nonviolent" nature of the flotilla is a myth, though a well-staged one. The Israelis did carry side arms, but were under orders not to use them unless their lives were in danger. At first they tried using nonlethal methods to break up the attack. They had paintball guns to disperse the crowds, but those were not sufficient to stave off the threat. Video exists showing Mavi Marmara protesters attacking Israeli soldiers, beating them with metal pipes and chairs, and throwing one Israeli soldier over the railing to a deck below. The soldier suffered a serious wound to the head. Now let's look at the assumption that these protesters were trying to relieve a "humanitarian crisis" in Gaza. The reason for the blockade is simple. It is not to impose suffering on the Palestinian people. Hamas has been importing material to manufacture weapons and an infrastructure of bunkers it has used to attack Israeli citizens inside Israel. Israel's goal is to keep out those materials while allowing genuine humanitarian aid to enter. Therefore Israel offered to dock the Mavi Marmara at Ashdod and offload the cargo there, then transfer all verified humanitarian supplies to Gaza - a reasonable compromise. The protesters refused. A peaceful move like that would have undermined the purpose of their mission and cost them their moment of drama. The plain fact is that Israel is not starving Gaza and is not holding up humanitarian aid. Israel maintains an open corridor for the delivery of food and humanitarian supplies to Gaza by recognized groups such as the UN and Red Cross. Every week Israel arranges the delivery of 15,000 tons of supplies on hundreds of trucks - more than the 10,000 tons carried on the flotilla. These goods include not only food but building supplies. Imports of cement and iron must be controlled because Hamas uses them to cast bunkers and rockets for attacking Israeli cities. Nevertheless, tons of iron and cement are regularly allowed into Gaza under carefully monitored safeguards ensuring they will not go to Hamas for military purposes. Gazans are suffering not because Israel prohibits aid from getting through to them - it doesn't - but because Hamas steals a lot of that aid. Last year the United Nations Relief and Works Agency (UNRWA) had to suspend humanitarian aid to Gaza because Hamas was stealing it. Specifically, Hamas seized truckloads of rice and flour and confiscated by force of arms thousands of blankets and food parcels intended for the poor. In spite of this theft by Hamas, ample goods are reaching the people of Gaza. This is true not only because Israel allows these goods to enter legally, but also because of a thriving economy in items smuggled through tunnels across the Egyptian border. According to a very recent report in the Financial Times of London, "Shops all over Gaza are bursting with goods" from this literally underground economy. In fact many of these goods have become so abundant that merchants are complaining about falling prices. And now, irony of ironies: After so much concern about a humanitarian crisis, Hamas is refusing to allow into Gaza the 21 truckloads of goods from the flotilla, which were safely offloaded at Ashdod. Hamas says it wants all flotilla passengers released first. First, Israel is in process of releasing the detainees. Second, and more to the point, if Hamas has a gripe with Israel, why hold the Palestinian people hostage? If the humanitarian "crisis" is really so acute, how can Hamas possibly excuse withholding these vital supplies from the people simply because it wants to punish Israel? If a humanitarian crisis really does exist in Gaza, many aren't feeling it. There is indeed suffering in Gaza; I would not deny that. But if a humanitarian mission is truly needed, it should be targeted at Hamas. Who were the flotilla organizers? So just who are these "Freedom Flotilla humanitarians"? Two principal groups are involved, the Turkish Insani Yardim Vakfi (IHH), and the Free Gaza Movement (FGM). The IHH is a Turkish Islamic NGO and owner-operator of three of the ships, including the Mavi Marmara. A report by the Danish Institute for International Studies identifies the IHH as a "charitable front group" supporting terrorist groups such as Al Qaeda and the Sunni insurgents in Iraq. An investigation by Turkish Authorities (before Turkey's current Islamist government took power) found even more: that the IHH had procured firearms, explosives, and bomb-making instructions and was sending jihadists to fight in Afghanistan, Bosnia, and Chechnya (Kohlmann, 2006). A French intelligence report (citation in Kohlmann, 2006) found that the IHH was recruiting soldiers for a coming "holy war" and sending them to war zones in Muslim countries to get combat experience (see Isseroff, 2010 for further details). "Remember Khaybar, Khaybar, O Jews! The army of Muhammad will return!" The clip ends with one woman passenger proudly proclaiming: "Right now we face one of two happy endings: either martyrdom or reaching Gaza." It looks like they got what they wanted. The other group involved with the flotilla, the Free Gaza Movement, also has a distinguished membership. The FGM is a coalition of pro-Palestinian activists. They were the main coordinators of the flotilla, and its board of directors prominently includes Adam Shapiro and Huwaida Arraf, founding members of the International Solidarity Movement. Arraf is actually the board chair of the FGM and was herself aboard one of the ships. The International Solidarity Movement (ISM) practices to perfection the pretense of nonviolence and peace while actually supporting violence and terrorism. While ISM members do not engage directly in violence, they make no secret of supporting those who do. They even say the Palestinian "resistance" must be "both nonviolent and violent." The ISM in fact has ties to violent groups such as Hamas and Islamic Jihad. It has supported terrorists and shielded them from Israeli authorities. It is no coincidence that these people are behind the Free Gaza Movement. They are practicing the identical strategy: using the language of peace and humanitarianism to mask an act of war. And that is exactly what the flotilla action was. Its purpose was to break the Israeli blockade in order to enable the free flow of weapons to Hamas. It is the same purpose the ISM had when it tried to block Israeli bulldozers from demolishing tunnels used for smuggling weapons into Gaza. It works by prostituting the language of peace to support the Hamas war effort. Here is another glimpse of the sincerity of the peace-loving humanitarians. The following exchange was captured from a radio transmission between the Israeli Navy and one of the flotilla ships. You can hear it yourself on YouTube (find both edited and unedited versions listed at the end of this article). Israeli ship: This is the Israeli Navy. You are approaching an area which is under a naval blockade. Flotilla ship: Shut up! Go back to Auschwitz. An illegal act of piracy? So was the Israeli raid on the flotilla illegal, as many claim? Was it even an act of piracy? The San Remo Manual on International Law Applicable to Armed Conflicts at Sea states (Section V) that "merchant vessels flying the flag of neutral states" may be attacked if "they are believed on reasonable grounds to be carrying contraband or breaching a blockade, and after prior warning they intentionally and clearly refuse to stop, or intentionally and clearly resist visit, search or capture." This is precisely what happened in this case. The flotilla's stated intent was to breach the blockade. And there is clear video evidence that the ships were warned and refused to stop. Section VI states further that such ships may even be captured if they are attempting to breach a blockade. Hamas is openly at war with Israel. It has used the seas to bring in materials for its war effort. Thus the blockade is justified under international law. But what about the charge that Israel had no right to stop the ships in international waters? Posner (2010) points out that there is longstanding precedent in international law for enforcing "publicly announced blockades on the high seas." In word and in deed, the Hamas government in Gaza has declared itself in mortal conflict with Israel. Israel has the right to try to stop the buildup of Hamas's military capability. Israel has a strong moral and legal case for the actions it took. Nevertheless, it hardly seems to matter. Israel has never been more isolated than it is right now. How can we explain this? The explanation cannot be legal: there is a basis in international law for what Israel did, and in any case most anti-Israel demonstrators are not familiar with the subtleties of the law. The explanation cannot be moral, for the clear double standard by which Israel is judged cannot be justified morally. Because it too has fears of being destabilized Egypt enforces a strict blockade of its own border with Gaza, yet there is hardly any reaction and nobody accuses Egypt of occupying Gaza. Gaza fires rockets on Israeli cities, which is the whole reason for the blockade, and no one seems to think it's important. North Korea sinks a South Korean ship, and it hardly gets an eye blink. Saudi Arabia uses its oil wealth to bankroll terrorists around the world, and nobody notices. In Afghanistan girls' schools are attacked with poisoned gas and female students get acid splashed into their faces, and nobody protests, demonstrates, or sends freedom flotillas. The examples are endless - just tour the globe and you will find them. China and Tibet, Iran and its homosexuals and Bahais - situations far more serious than what happened on this flotilla, yet hardly eliciting a squeak of protest in comparison to the international uproar against Israel for trying to take measures to protect its cities. There is an obvious explanation, but I won't mention it because Jews aren't allowed to talk about it anymore. So I'll mention the not-so-obvious explanation, which can be captured in one word: politics. Political conditions have shifted to isolate Israel more than ever. The Muslim world, which has hated Israel since its inception, has become stronger and more assertive, especially since the collapse of the Soviet Union. The Arabs have oil, Israel does not, and the world is more dependent on oil, not less. Islam has experienced a revival, and with that also the conflicts with Jews enshrined in its scriptures - the chants of "Khaybar! Khaybar!" heard aboard the flotilla were no unique occurence; similar language is common in the Arab world and especially among Palestinians. Turkey now has an Islamist government, interested in proving its Islamic credentials and willing to approach Iran by provoking an incident with Israel. The Palestinians have also become experts at manipulating the media. In this electronic age they are way ahead of Israel in harnessing the potential of the latest media channels such as Facebook and Twitter and YouTube, though Israel is beginning to catch up. The medium has indeed become the message. This brings us to the Palestinians' greatest success: turning the language of morality into political cant. It seems incredible, yet with proper massaging words can be made to convey precisely the opposite of what they were intended to mean. Just keep selling the idea hard enough and often enough, and if it jibes with something people already wish to believe, then it will stick. Here is a great example: When Hamas took over Gaza by force in 2007 and threw out Fatah, it proclaimed in radio messages that it had "liberated" Gaza (Tran, 2007). And so again the Palestinians have skewered the language of morality to enable people to believe what they want to believe for political reasons, with the comfortable delusion that they are rising above politics. If the mission of the flotilla were truly humanitarian, there would have been a way to deliver those supplies wihout a confrontation. Israel offered to have them unloaded at Ashdod, inspected for weapons materials, and then sent to Gaza. But that would have ruined the protesters' plans to create an incident even at the expense of jeopardizing their mission to get those "vitally needed" supplies to the people of Gaza. What the flotilla people don't want you to know is that every week Israel allows the transfer into Gaza of 50% more supplies than were carried on those ships. What they don't want you to know is that Israel is not starving the people of Gaza, and that Gaza markets have been overflowing. What they don't want you to know is the true purpose of their mission: to leverage international opinion to break the blockade so that bombs and missiles can once again flow freely to Hamas. Seen in this light, the flotilla must be considered an act of aggression, whose mission would result in putting Israeli towns and cities in danger. Yet it was billed as "humanitarian," a mission of "freedom," so that those who support aggression against Israel can do so with a clear conscience, perhaps sincerely believing they are doing what's morally right. And this is the most devastating and cynical victory of all: the transformation of language to make people truly believe that wrong is right. When Hamas began shooting rockets at Sderot and other towns in southern Israel, people dismissed them as kids firing home-made firecrackers. Yet people were wounded and killed. And since then Hamas has steadily increased the range and payload of its rockets. With no Israeli blockade in place, Iran-backed Hamas could start importing long-range Iranian missiles capable of striking Haifa and Tel Aviv. Understandably Israel does not want to wait until this happens. Clearly Hamas is not entitled to the language of morality it is exploiting for political purposes. We may not be able to change the political situation, but we must take back the language. We must expose the lie behind the "humanitarian" effort to support a regime with a murderous agenda. We need to unravel the deceptions, reminding ourselves that war is not peace, freedom is not slavery, and sometimes even "humanitarianism" can be aggression by another name. Abu Toameh, Khaled, Ron Friedman, and Abe Selig. "Flotilla Aid Refused by Hamas." Jerusalem Post, June 3, 2010. "Behind the Headlines: The Israeli Humanitarian Lifeline to Gaza." Israeli Ministry of Foreign Affairs, May 25, 2010. Buck, Tobias. 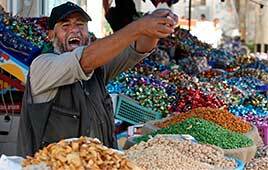 "Gaza Looks Beyond Tunnel Economy." Financial Times, May 23, 2010. "Clarification/Correction Regarding Audio Transmission Between Israeli Navy and Flotilla on 31 May 2010, Posted on 5 June 2010." IDF Spokesperson, June 5, 2010. Deutsche Presse-Agentur (DPA). "Hamas Blocking Entry of Flotilla Aid into Gaza." Haaretz, June 3, 2010. Gordis, Daniel. "A Botched Raid, a Vital Embargo." New York Times, June 2, 2010. Haaretz Service. "IDF Video Shows Flotilla Passengers Tell Israel Navy to 'Go Back to Auschwitz'." Haaretz, June 4, 2010. Haaretz Service and Associated Press. "UN, Hamas Meet to Discuss Stolen Gaza Aid." Haaretz, February 6, 2009. "IDF Clarifies: 'Go Back to Auschwitz' Recording Edited, but Authentic." Haaretz, June 6, 2010. Isseroff, Ami. "Who Is Behind the Gaza 'Freedom Flotilla'?." Zionism & Israel Information Center, May 30, 2010. Kohlmann, Evan F. "The Role of Islamic Charities in International Terrorist Recruitment and Financing." DAnish Institute for International Studies, 2006. Levitt, Matthew, David Makovsky, and Jeffrey White. "Fallout from the Gaza Flotilla Tragedy." Washington Institute, June 1, 2010. Oren, Michael B. "An Assault, Cloaked in Peace." New York Times, June 2, 2010. Phillips, Melanie. "'Peace Convoy'? This Was an Islamist Terror Ambush." Spectator (UK), May 31, 2010. Posner, Eric. "The Gaza Blockade and International Law." Wall Street Journal, June 4, 2010. Ravid, Barak and Yuval Azoulay. "Israel: Gaza Aid Convoy Can Unload Cargo in Ashdod for Inspection." Haaretz, May 27, 2010. "San Remo Manual on International Law Applicable to Armed Conflicts at Sea." International Committee of the Red Cross, June 12, 1994. "Three Dozen Girl Students Were Poisoned in Afghanistan." Rawa News, April 26, 2009. "97 Girl Students, Teachers Poisoned in Afghanistan." Rawa News, May 12, 2009. Tran, Mark. "Hamas on Brink of Gaza Takeover." Guardian, June 14, 2007. "Flotilla Rioters Prepare Metal Rods, Slingshots, Broken Bottles, and Metal Objects to Attack IDF Soldiers." IDF Spokesperson's Unit, June 2, 2010. "IDF Navy Soldiers Who Were Attacked Aboard the Marmara Ship." IDF Spokesperson's Unit, May 31, 2010. "IDF Navy Warns Flotilla." Israel Ministry of Foreign Affairs, May 30, 2010. "Mavi Marmara to Israeli Navy: 'We're Helping Arabs Go Against the US, Don't Forget 9/11 Guys'." IDF Spokesperson's Unit, June 4, 2010. "Unedited Radio Transmission Between Gaza Flotilla and Israeli Navy on 31 May, 2010." IDF Spokesperson's Unit, June 5	, 2010.